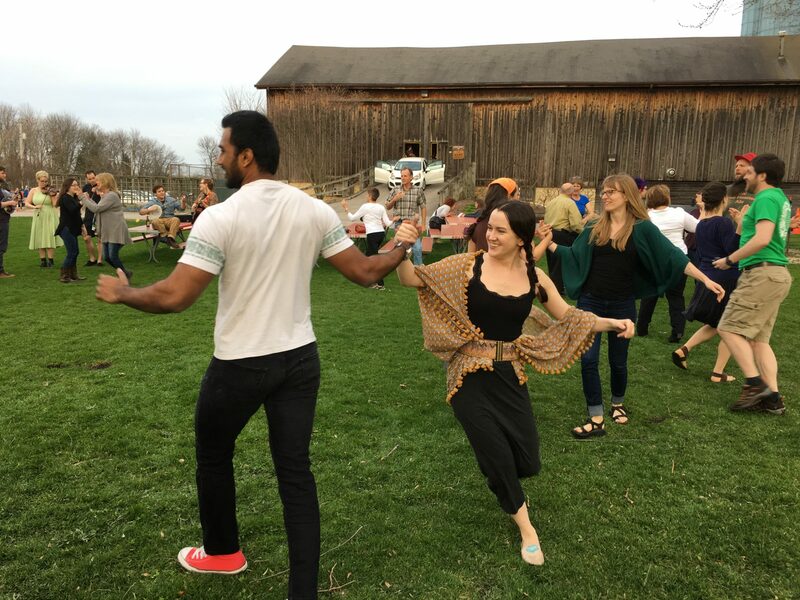 Editor’s note: On Sunday, May 13, Fermilab dance co-hosts Lynn Garren and Dave Harding will celebrate the 40th anniversary of barn dancing at Fermilab with a special tour and talk. Dancers are invited to meet in Wilson Hall at 2 p.m. for socializing and snacks. This will be followed by a talk in Wilson Hall’s One West conference room and a tour of part of the Fermilab accelerator complex. Note that children under 10 are excluded from some parts of the tour. 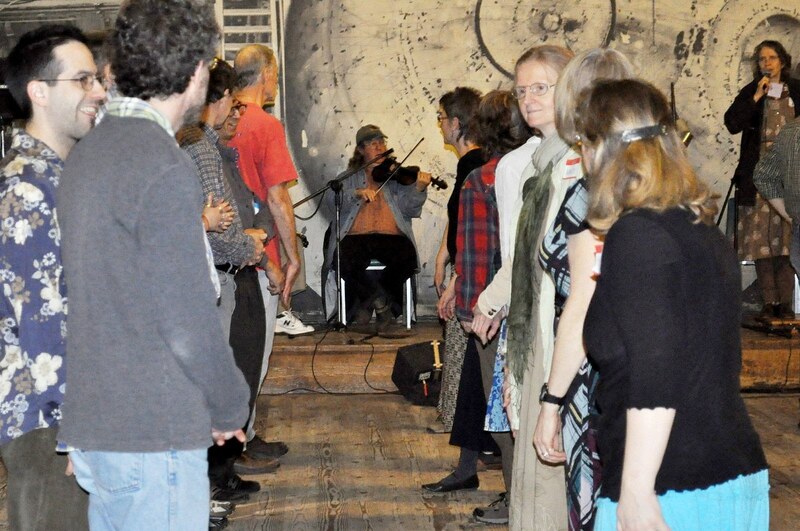 Space for the tour is limited, so if you’d like to attend, please register by emailing folkclub@fnal.gov. At 5 p.m., everyone is invited to bring a picnic supper to Kuhn Barn, followed by dancing at 6:30. There is no charge to participants beyond the regular admission to the dance ($7 for adults, $4 for teens and seniors). 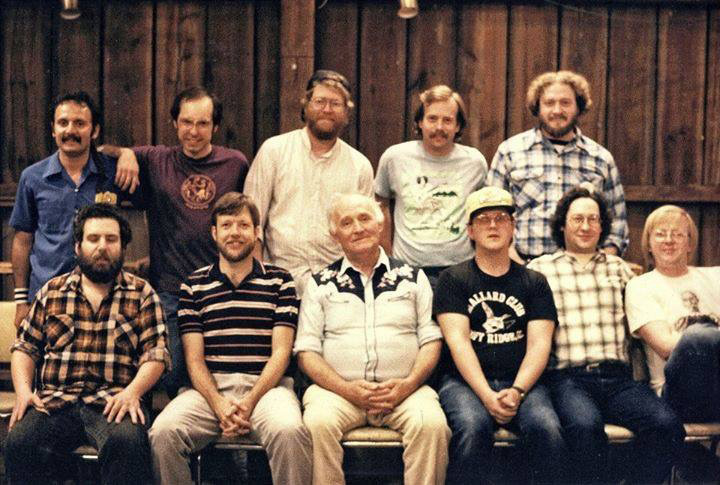 Fermilab’s Folk Music Club, first organized by laboratory operations coordinator Dave Hanssen and his wife Betty, held its charter meeting in February 1978, and it sponsored the first Fermilab barn dance a few months later, on May 13, 1978. That first dance, which the club held in Kuhn Barn, featured music by the Chicago Barn Dance Company and contra, circle, and square dances. It was open to anyone at the lab. 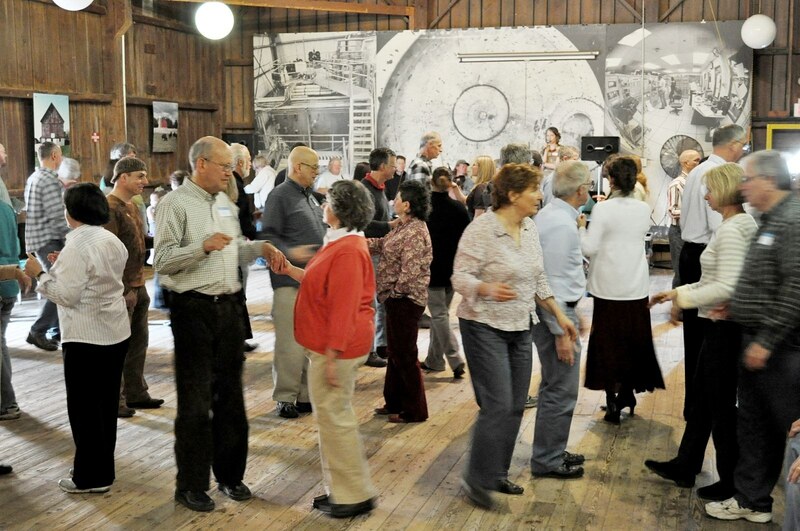 Forty years later, the Fermilab Barn Dance is still going strong. 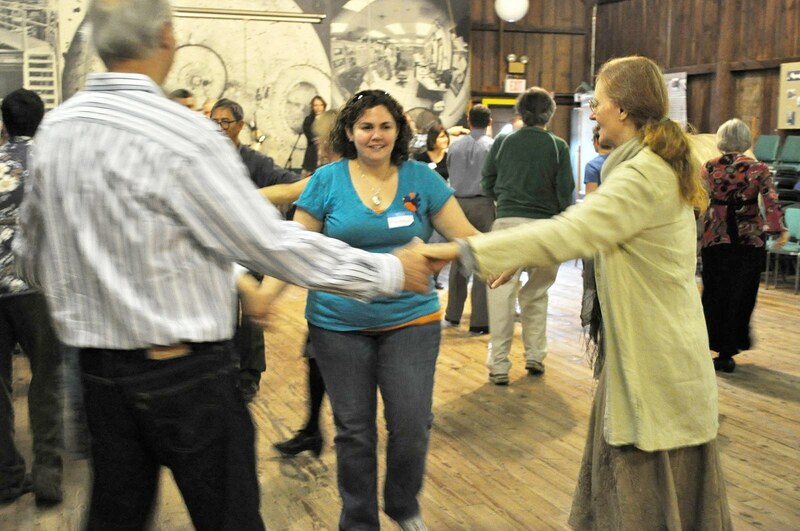 After that first 1978 event, the barn dances soon became a monthly occurrence at the lab between September and June. 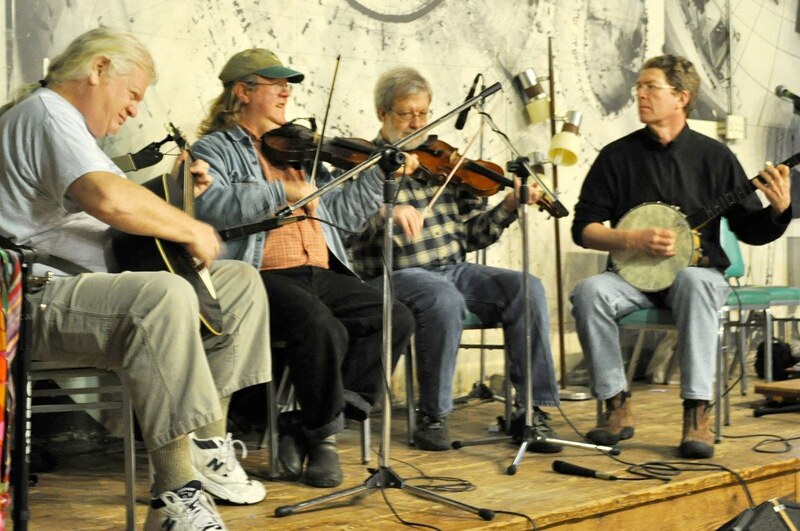 They are organized by the Fermilab Folk Club in cooperation with the Fox Valley Folklore Society and the Chicago Barn Dance Company. 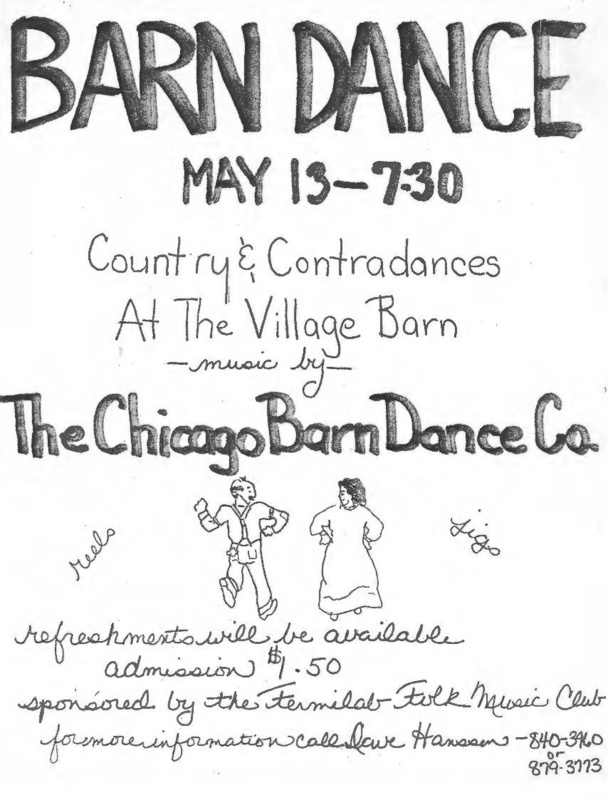 The Chicago Barn Dance Company provided the music for the early dances, but by the 1990s the dances were also featuring other groups such as the Dead Mules, Chirps Smith and Friends, the Blind Tigers, the Bean Walkers, the Common Taters, the Volo Bogtrotters and others. The events also feature a “caller” who first teaches each dance and then gives step-by-step instructions throughout the dance. The Fermilab Barn Dances have had a variety of callers over the years, including nationally known Colin Hume, Maggie Jo Saylor and Phil Jamison. 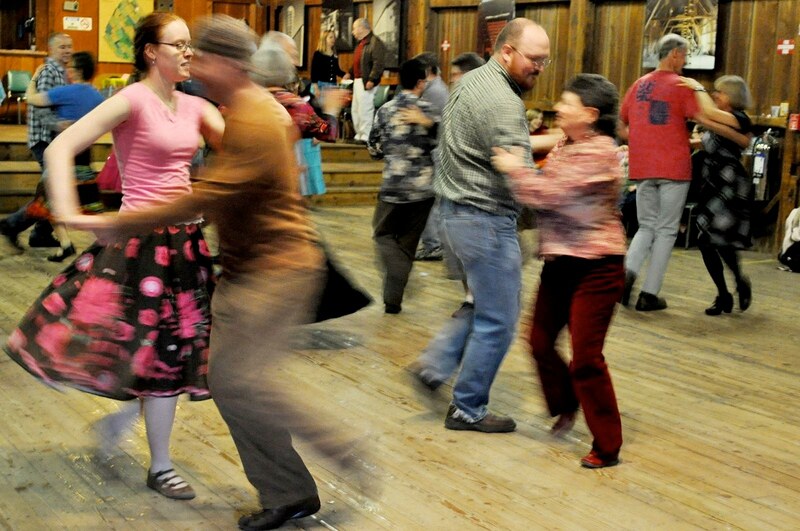 Some of the barn dances have also included clog dancing demonstrations and lessons. Publicity for the first Fermilab barn dance. Gene Dentino took over organizational duties from the Hanssens, serving as the host of the barn dances from around 1984 until September 1993, when Lynn Garren and Dave Harding became co-hosts. Garren and Harding still lead the group today. In 1984, attendance at the barn dances averaged around 30, but by 1993 the event usually drew over one hundred participants. Garren’s contacts with the folk music circuit enabled the club to book new performers, such as Blind Squirrel and the Good Intentions Paving Company. Garren and Harding expanded the schedule to twice-monthly dances between November and April. Throughout the group’s history, Fermilab’s Kuhn Barn has provided an ideal setting for these events. Valerie Higgins is Fermilab’s archivist and historian. You can read the first announcements seeking interest in starting up a Folk Music Club at Fermilab in the Feb. 9, 1978 (page 4) and Feb. 23, 1978 (page 2) issues of The Village Crier. The notice announcing the first Fermilab barn dance appeared in the May 11, 1978 (page 2) issue of Ferminews. Learn more about the Chicago Barn Dance Company and the growth in the 1980s of the barn dance scene in Chicagoland. Barn dancing at Fermilab, with traditional American contra and square dances, is taught and called to live music the second Sunday of the month at 6:30 p.m. from September through June, and the third Sunday of the month at 2 p.m. from November to April. The barn dances are presented by the Fermilab Folk Club in conjunction with the Fox Valley Folklore Society and the Chicago Barn Dance Company. Barn dancing is held at the Kuhn Village Barn. Please send email to folkclub@fnal.gov for more information.